In the beginning there was only breath, then influx and overflow. This post has long been overdue. A new recipe along with a new site design (from the lovely Erin of The Overgrowth), and much more to come in the new year too. There’s been plenty of change over the last few months. I guess that part’s inevitable with the passage of time. But I never forgot this space or lost sight of my obligation to it. So, this isn’t a fresh start. Nor is it a return to the one that came before. Rather, it’s an evolution. Of the self as reflected throughout these pages. A creative progression. And I’m excited for it. I know it’s been a while, but let’s pick up from where we left off. I’ll be heading to Paris in the next few days and it’ll be well into the beginning of the new year before I return. To be wintered will be a welcome change from the intense heat and swelter that comes with living in the southern hemisphere. I aim to update regularly on social media and then later on this space too. (Let me know in the comment section below if a travel post is something you would like to see, along with anything else for the new year!) Last year in Paris I was asked to create this Hazelnut Streusel and Brown Butter Apple Pie for Sofia Coppola’s film, The Beguiled. It was summer then, but I still consider it perfect for times both hot and cold. You can also keep updated with regular recipes in my monthly column for the ABC. We’ve worked on some wonderfully delicious things so far, with plenty more to come. 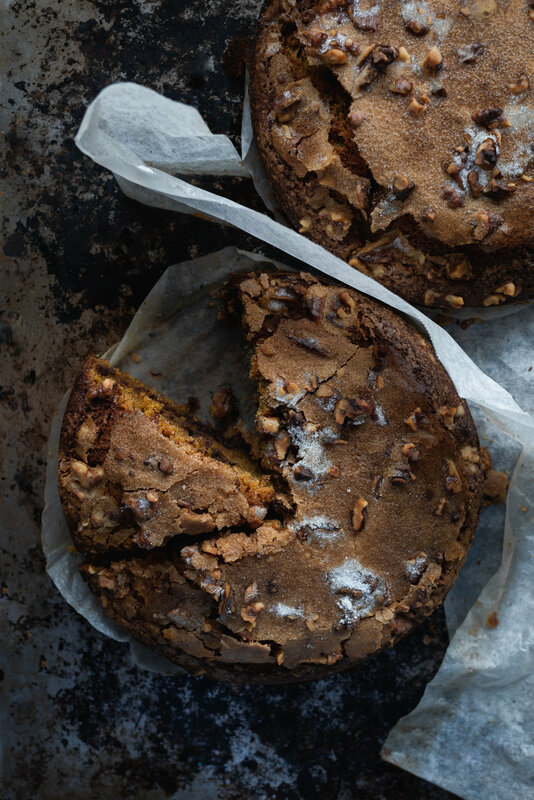 And onto this Sugared Pumpkin Olive Oil Cake with Dark Chocolate, flavorally inspired by one of the greatest cake's from Gjelina. It’s an effortless and quick kind of cake that’s filled with a wealth of comforting, fragrant, and deeply spiced character. The crackled-sugared-nutty top is my favorite part, along with all the pockets of molten dark chocolate flecks throughout. The olive oil renders the cake’s crumb soft, tender, and moist, with an almost bitter depth. Make sure to serve the slices thick with generous spoonfuls of crème fraîche for something even better. - The recipe calls for unsweetened pumpkin purée. Here, I’ve roasted my own pumpkin until soft and then blended it into a fine purée. Canned pumpkin (the one without added sugars and spices) can be used too. - You can substitute the amount of olive oil used for an equal amount of melted and cooled unsalted butter if desired. The butter can even be browned off, for something even more rich, earthy, and intense. - I prefer to serve the slices with a good dollop of crème fraîche, which cuts through all the richness within. It’s just as good served with lightly whipped cream or even a little natural yoghurt too. Center a rack in the middle of the oven. Pre-heat the oven to 180 Celsius (350 Fahrenheit). Grease and line a 22-cm (9-inch) cake pan with non-stick parchment paper. In a medium mixing bowl, whisk together the flour, cinnamon, nutmeg, allspice, baking powder, baking soda, and salt. Put the sugar into a separate large mixing bowl. Add in the oil and whisk to combine. Add in the eggs one at a time and whisking well after each addition until the mixture is smooth and glossy. Whisk in the vanilla extract. Add in the pumpkin puree and whisk until well combined. Whisk the dry ingredients into the wet ingredients until just combined. Fold in the chocolate until evenly distributed throughout the batter. Pour the batter into the prepared pan. Scatter the pumpkin seeds or nuts over the top then sprinkle over the remaining 2 tablespoons of sugar. Bake for 30 to 35 minutes or until lightly golden brown and fragrant. The top of the cake should have risen and crackled. A wooden skewer inserted into the middle should come out with a few moist-chocolaty crumbs attached. Remove from the oven and allow the cake to cool in its pan for 15 minutes before carefully setting it out and onto a wire rack to cool further. The cake is best served warm or at room temperature on the day of making.